Most people don’t peek into their attic and crawl space until unpleasant odors, rodent infestations, or other annoying issues surface. If appropriate remedial steps are not taken in time the damage caused by these unwanted intrusions can pose serious health and safety risks. Regular inspections of your attic and crawl space by seasoned professionals can make the maintenance of these functional areas a whole lot easier. Quartz Solutions is the perfect answer to take control of the situation. With our tried and tested techniques, expertise and years of experience, we will tackle all your attic and crawl space woes effectively and get your home back to a healthy state. A neglected attic and crawl space presents a favorable environment for a host problems that can jeopardize the overall health and well-being of the inmates. Needless to add that the dismal scenario robs peace of mind and drains hard earned money in expensive repairs. Excessive moisture and humidity become an ideal breeding ground for mold, wood rot, and corrosion. This not only impacts the structural integrity of the property but the harmful spores that infiltrate living space air are damaging to health. 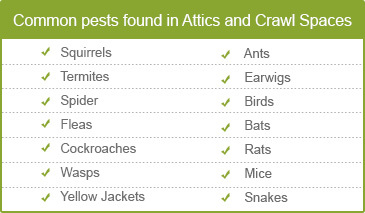 Insects like fleas, spiders, wasps, roaches and termites are a nuisance and carriers of dangerous infections. Rats, raccoons, bats, and squirrels can nibble right through vents, cables, wires, ducts, plumbing system, insulation and more. Additionally, the high concentration of their dropping leaves behind an unbearable stench. Dripping ducts and damaged insulation messes the heating and cooling capacity of the building causing utility bills to accelerate. Quartz Solutions is the undisputed leader in this domain. We specialize in cleaning, insulating, and restoring attics and crawl spaces so that families can enjoy the comfort of their homes. Our skilled team will visit your premises for a free assessment and examine every nook and cranny closely. The presence of infestations will be jotted, area tested for toxic gases, and the condition of insulation ducts, pipes and wires thoroughly checked. Based on the existing and impending problems, an excellent remediation plan will be formulated at a nominal rate. At Quartz Solutions, customer satisfaction is the top priority. Our attic and crawl space sensitization project is tailor made to meet the client’s needs, schedule and budget. Berkeley Heights, a township in Union County, New Jersey holds the distinction of being selected the 6th best place to live in America in 2013 by CNN’s Money Magazine. The town with its lush green space, great schools, spacious parks and recreational programs is indeed a wonderful place to raise families. Let Quartz Solutions assist this wonderful community by providing the 13,407 odd residents healthy, safe, and comfortable homes. 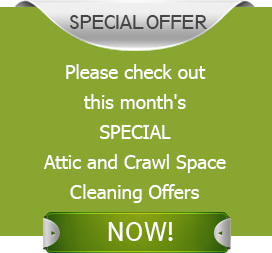 Hire us to keep the attic and crawl spaces throughout Berkeley Heights in top-notch condition. Call today at 973-536-1013 for a complimentary inspection and consultation.